Sorry for the delay - had 2 weeks of grandchild visits including 5 days in WDC! I would say the summery word is "intense." The plethora of scooters without rule but with horns made any strolling a life challenging adventure. Except for sleeping we were at school teaching from 8am-4pm - grades 6-7-8-9 were pretty intense, too! But there were 2-3 in each class who were truly engaged and said thanks. One would have crawled into the airline overhead bin if I let him! I met some delightful and dedicated teachers. But the biggest "intensity" was in the people I saw every day. They were purposeful and driven, hard working and busy. Even the tour guide had a set agenda and was determined to get through it. I observed this to a much greater degree in Russia - an individual personal agenda so strong that nothing was allowed in the way - least of all another human. I think it is part of a communist attitude to keep one's head down and stay out of other people's business. I did see a lot of family life - multigenerational families in shops or eating on the street, both parents and grandparents carrying babies. 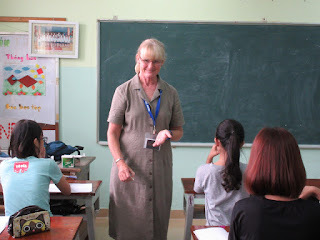 The teachers told me that grandma often lives with them and is in charge of child care. Two children seems to be the norm in the city. 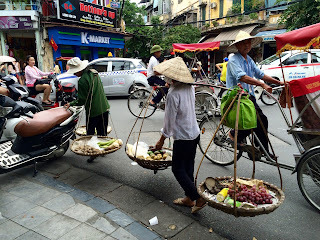 I wish I had seen the countryside, but Hanoi had a lot to offer. The salads we ate were unbelievable! I have no idea what dressings they use but they made shredded carrots delightful. I am glad I went - for such a defining part of my life in the US, our "invasion" there seems to have made little difference in the north. It may be different where we actually had troops stationed. As always I am glad to be home and grateful for all we have here. One more day of teaching! It has gone really fast in a blur of changing classes and wonderful dinners and scooters everywhere. I achieved my usual goal of being able to walk around town on my own, buy souvenirs with the local money and find my way home. And taught English, too. I had one teacher ask for a lesson on houses so since I teach the same lesson to all the classes - adjusting some for different grades - I downloaded pictures of hut, igloo, tent, pueblo and RV and made a power point. Love the Internet! Kids chose the one they would like to spend time in and guess what won by a landslide? Also the 5 lb of magazines I brought over have been good teaching tools, so it was worth it. They are not coming back because I really do not read Car and Driver or Twist for Teens - even at the airport. Tonight is banquet given by the school - since today at lunch there was browned pork crumbles, rice and peanuts, I am ready. And tomorrow we say goodbye. Not as tearful as other years since I see 30 kids a class, 6 classes a day, 5 days a week...but they all know me! 83% of a Vietnam are Khun. Certainly everyone in Hanoi is. The 53 minority groups are in the mountains of along the borders with Chicago and Laos. But they have a very interesting museum about the ethnic groups. Inside are some nice displays, but outside are life sized reproductions of the houses in the ethnic groups. Very elaborate. But no wonder they did not understand how Obama and I could live in the same city! The biggest contribution was switching the language or reading from Chinese characters to Western ones. The literacy rate soared as children could form and read the 26 letters needed. The only signs in Chinese characters are on Temples. I was asked to explain a power point the teacher had about important sights in America. What would you pick? This showed NY without the Statue of Liberty, Washington DC mall, Saturn rocket center in AL, Golden Gate Bridge, Badlands and an arctic preservation in Alaska. The next section showed characteristics of each area: north, south, east, west. West of course showed Hollywood, a buxom blond and a star in the sidewalk. North showed snow, east, cities. But the south featured "southern drawl" (to non English speakers) and "wife beaters"! Also Disneyworld. Don't believe everything you see on the Internet! Ah the suspicious mind of the westerner! I was sure the loud speaks at every corner were pumping propaganda - turns out it is the current weather and what is on TV tonight. No pays attention because they all have on demand. And nothing will change the weather anyway. This is one of my 6 classes I teach we each day. I have a topic planned but the teacher at any moment can decide she wants to work on...the different uses of "will" vs "am going to." I tried to tell her mostEnglish speakers use them interchangeably, her work sheet said....so that is what I did too. Retirement is not sitting still - it is only doing what you love! I divide my time between Nana-dom for 5 Grandblessings, pastoral work St Mark's Episcopal, and writing stuff I hope gets published.